On today's sketch, I created this sweet layout using the Artbooking cartridge and the "Cupcake" from the Artiste cartridge. There is a "Cupcake" image on the Artbooking cartridge but it does have a candle welded on the image. 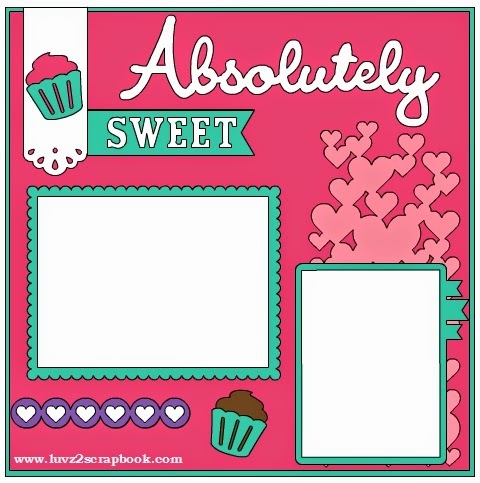 You can substitute the "Cupcake" image with lollipops or candies or even other cupcake images to make this layout you. This scrapbook layout was designed on the Cricut Design Space using images from Close To My Heart's Artbooking Cartridge and Artiste Cartridge. You can make this scrapbook page in a variety of sizes using plain colored card stock, patterned paper or glitter paper. Add your favorite embellishments and photos to fit your needs.